While much of the world’s cargo is still transported by sea, most port cities have seen such functions move out of the urban centre to more strategic heavy-industry port sites, leaving city harbours, rivers, canals and former docks not just free for leisure cruises and moored houseboats, but swiftly becoming ripe for on-water development. In global cities where land is at a premium, it seems that water has become the new land. Rather than reclaiming land for development, as is happening in emerging and rapidly growing cities around the world, this approach is about repurposing the underused post-industrial waterscape in cities for new uses. Just like old urban transport infrastructure such as disused railway track is being transformed — think New York’s High Line or Atlanta’s BeltLine — so are our waterways and docks. Cities with an abundance of waterways, like those in the Netherlands, have been some of the first places to embrace such opportunities. Of course, in a time of ongoing urbanisation and population growth, the kind of development at the top of most municipal agendas is housing. Although canals and rivers have long been used for homes in the form of barges and houseboats, ambitions are evolving: whole fixed floating residential developments are being planned — and built. In Rotterdam’s Nassauhaven harbour basin — the site of former docks in the city’s Feijenoord district — a pilot project consisting of 18 floating homes, the Harbour Loft Apartments, has been designed by local practice Public Domain Architects. Having worked on floating constructions since 2005, the practice gained attention for its Floating Pavilion (2010), a project of three interconnected bubble-like hemispheres made from ultra lightweight ETFE used as a floating events space in Rijnhaven, a former industrial harbour in central Rotterdam. The eco-friendly, detached Harbour Loft Apartments will be prefabricated and constructed offsite and towed with ready-made pontoons to the Nassauhaven this summer, where they will be moored along the west bank. Just don’t call them ‘houseboats’ — project architect Pieter Figdor believes that term conjures up notions of unstable structures. ‘It’s not possible to endure life in a houseboat in harbours on a big river with a direct connection to the sea — it can get pretty rough in these harbour basins,’ he says. Because of this, a high level of stability is built into the house design. Each harbour loft home incorporates a 130 sq m concrete pontoon held firmly in place by mooring poles, which dampens movement and makes the homes unsinkable (according to the insurance, at least). Every detail is measured to ensure the development is still light enough to float. Weight savings on the homes include slim, lightweight sandwich panels for the facades, finished in yellow cedar. Waterproofing is understandably also a priority: windows are triple glazed, with aluminium frames. Sizes and arrangements of the floating homes vary, coming in a standard two-storey or split-level, three-storey set-up; living areas range between 134 and 177 sq m. The homes have no gas connection, but are equipped with solar panels, a pellet heating installation (biomass burner) and their own water purification system. Figdor maintains that apart from the mandatory water connection, the harbour lofts are almost entirely self-sufficient. But what of the legalities? Figdor explains that the harbour lofts, as opposed to houseboats, will be recorded as immovable property. They may be located on a water plot, but there is a ground plot beneath them, and that is a decisive factor, he explains: ‘The municipality leases these ground plots in perpetuity.’ And banks are catching on — there are already two in Rotterdam that offer mortgages for such floating-yet-immovable properties. In terms of permissions, the Port Authority can decide the position of on-water developments, and local authorities decide on the planning permission. After the Harbour Loft Apartments, Public Domain Architects is planning another development of 50 to 80 homes on Rotterdam’s waterways. ‘The goal is to develop floating urban environments in good scalable steps,’ says Figdor. He and others see such urban waterways as underutlised assets — as available space to use in cities where space is at a premium. But maximising development is not the only apparent benefit of constructing on water; in a world that is experiencing the far-reaching impacts of climate change, including rising sea levels and the vulnerabilities which come with them, floating architecture can in fact be a more resilient, climate-adaptive way of building new developments in cities. Indeed in Rotterdam, the Harbour Loft Apartments are part of a much bigger transformation of the area. Feijenoord, located outside of levee protection, is vulnerable to flooding. As part of the residential development, a new tidal park will be created in Nassauhaven, one of many that will eventually fill the Nieuwe Maas, the river which runs through Rotterdam, as part of a ‘River as a Tidal Park’ programme. The tidal park involves the creation of an environmentally friendly, porous riverbank — in a city where most riverbanks are stone dominated — and a natural, tide-influenced bio diverse ecosystem, which will in part help improve water quality. The city believes the creation of such a riverbank and construction of floating homes offers opportunities to combine flood management and spatial development. 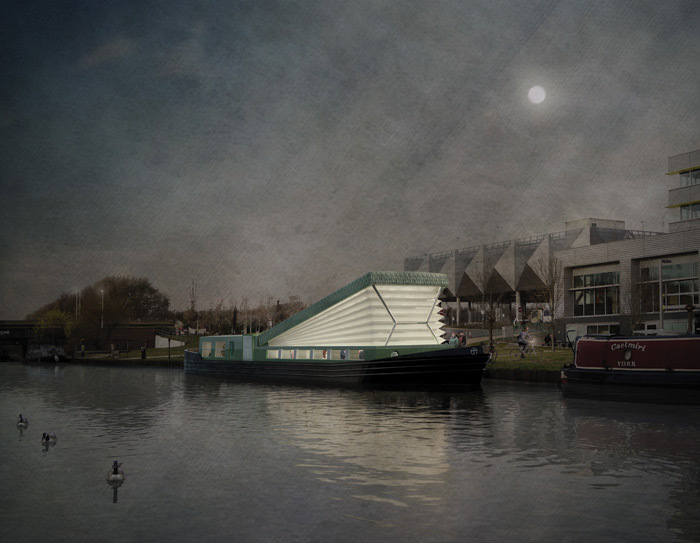 Floating housing in former docks is an idea that has also been put forward for London, though progress has stalled. 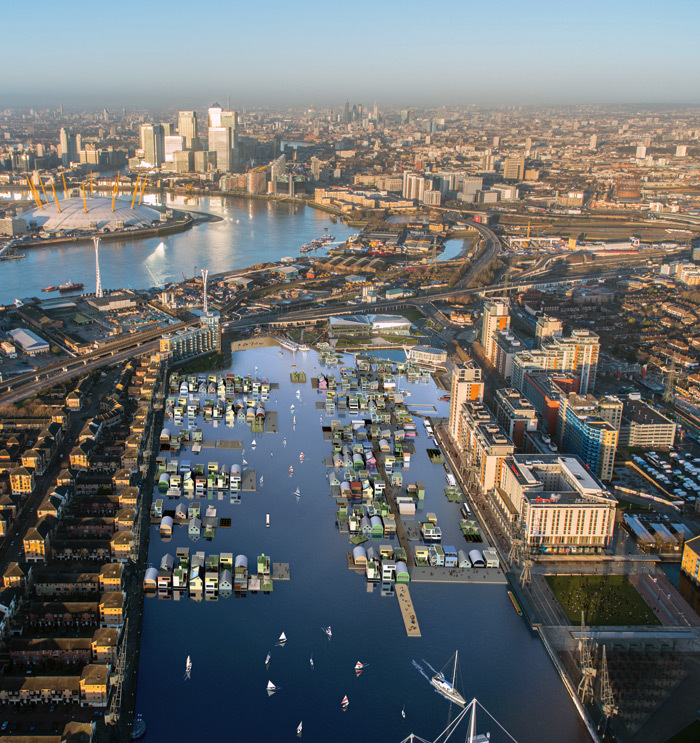 In 2014, dRMM, as part of a wider team assembled by developer Igloo, won a competition to design the UK’s first floating village in London’s Royal Victoria Dock, called Waterhood. dRMM envisaged the development of over 50 residential units, alongside a mix of commercial, leisure and cultural spaces, as ‘a floating part of London’. Historically a busy hub for trade, the docks are now used for little other than swimming and water sports. ‘After analysing Dutch precedents for floating housing, we considered the significance of reusing post-industrial water space in London,’ explains dRMM founding director Alex de Rijke. ‘The scheme encourages user-led floating homes, apartment blocks, sports facilities, workspaces, shops and more, set around open-water squares and public spaces. There are reconfigurable mixed uses that allow for change over time, according to need and economic drivers.’ While the project is on ice, de Rijke is adamant the design has not stalled for good. In Copenhagen, a floating student housing project called Urban Rigger — designed by Bjarke Ingels’ practice BIG — piloted in 2016. 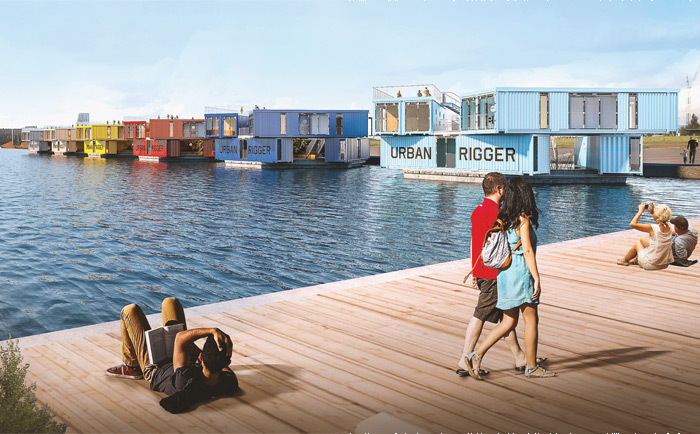 Consisting of stacked shipping containers on a floating platform in the city harbour, Urban Rigger reappropriates not only the waterways of former trade activity for new purposes, but the very materials used for such trade: containers. Although these rough-and-ready compact corrugated metal boxes have already been used to apparent success in various student-housing developments (such as the Wenckehof complex in Amsterdam, 2006), here they float in what company founder Kim Laudrup calls ‘an attractive untapped and geographically independent niche in the market’: underused urban waterways. The project is in part a response to the pressurised housing situation for the city’s students, who are often left without affordable accommodation. A single Urban Rigger complex — which houses 12 apartments — consists of nine containers arranged in two storeys of interlocking triangles, around a central, shared, courtyard garden. The ‘roofs’ of the containers are available to be used as recreation space, greenery or for photovoltaic panels. 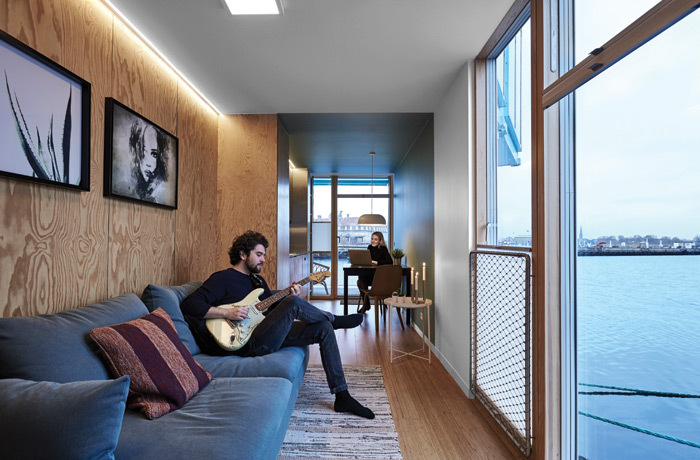 Student residents will officially move in to the first Urban Rigger, located in the city’s former industrial docks of Refshaleøen, this April. The idea is to replicate these units in a somewhat modular system: early 2019 will see five additional Urban Riggers (60 new apartments) join the first at the same location, creating a whole neighbourhood of floating housing — though it is not yet determined whether these will be aimed at young renters or private purchasers. Plans are on the drawing board for a complex of 24 Urban Riggers in Gothenburg, Sweden, and the ultimate ambition is to scale the idea internationally. But the plans for floating developments in cities go far beyond just housing. Floating offices, swimming pools and even farms are being constructed. In September of this year, the first floating dairy farm will open in Merwehaven in Rotterdam. Delivered by Beladon, a development company focused on sustainable floating constructions, the plans first drew ridicule when announced. ‘People were worried about seasick cows,’ jokes CEO Peter van Wingerden on a winter’s morning in Rotterdam. Although assurances have been given that cows do not, in fact, get ‘seasick’, there will certainly be plenty of them on the dairy farm: 40 to be precise, producing 800 litres of milk a day with the help of a robot milkmaid. The floating dairy farm structure is organised in two layers, set on a concrete base. The bottom level is dedicated to storage, processing, production and education — the farm aims to also serve as an education centre for children to understand agricultural processes and healthy food. The upper level of the structure is the ‘cow garden’, where the cows live and graze, with robots zipping around collecting manure and distributing food. Above is a canopy, which not only shelters the cows but allows for rainwater collection and captures solar energy through photovoltaic panels. ‘The cow garden is specially designed to create a living environment, which, as closely as possible, connects to the natural needs of the cow,’ says van Wingerden. ‘The pasture floor is an essential component of the design. This soft floor is just as comfortable as a meadow for the cow. The cattle graze and lie on a natural, green living environment. They can find shade and cooling beneath the planted trees, bushes and vines.’ The cows themselves determine when they want to be milked by the milking robot, apparently. The nutrients, energy and water cycles in the floating farm are closed as much as possible, in order to have a circular production system (even the cows’ manure is transformed into energy). Van Wingerden insists it is self-sufficient. However, as the current design includes an adjacent on-land pasture, it is not wholly a floating complex. 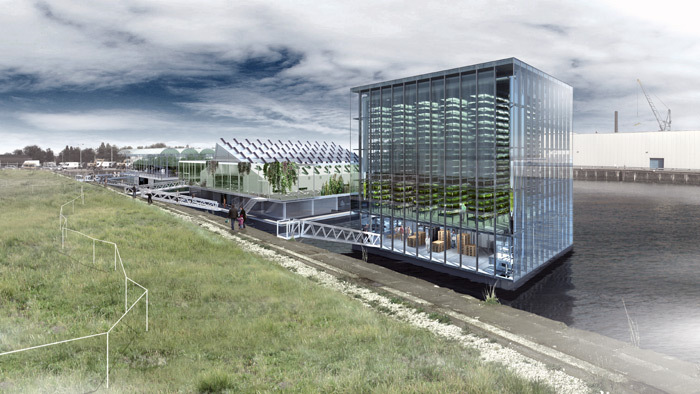 Floating farms may sound farcical, but this is no gimmick for gimmick’s sake. Van Wingerden passionately believes that cities which continue to rely on transported food will be completely unsustainable — and what efforts there are at urban agriculture at the moment are simply not enough, largely because there is little to no agricultural land available within urban centres. 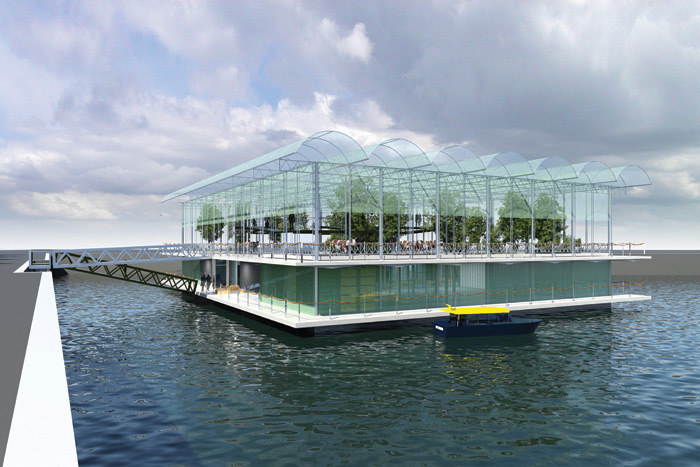 A floating farm, then, is a key strategy to feed the city, he argues. The ultimate aspiration is to create a kind of adaptable, modular design that can be placed in a variety of contexts. Beladon plans on next creating a floating chicken farm and vegetable farm — eventually mooring the floating farm structures alongside one another to create an entire ‘floating food strip’. Then, of course, there’s the goal of rolling the idea out to other cities around the world — expressions of interest have already come in from Singapore, Shanghai and New York. ‘Cities in strategic delta areas, where waterways flow deep into the urban centre, are particularly appropriate for the model,’ explains van Wingerden. Beladon is focused on more than farms though. Dokhotel, a five-storey, 64-room floating hotel — with the appearance of a minimal black grid block — is due to open on the river in Rotterdam in 2019. Also next year, the firm hopes to realise a floating sewage treatment plant in the city. Offices are taking to the waterways too. In 2015, Amsterdam-based Attika Architekten completed a three-storey, 875 sq m office block that floats on the city’s harbour. 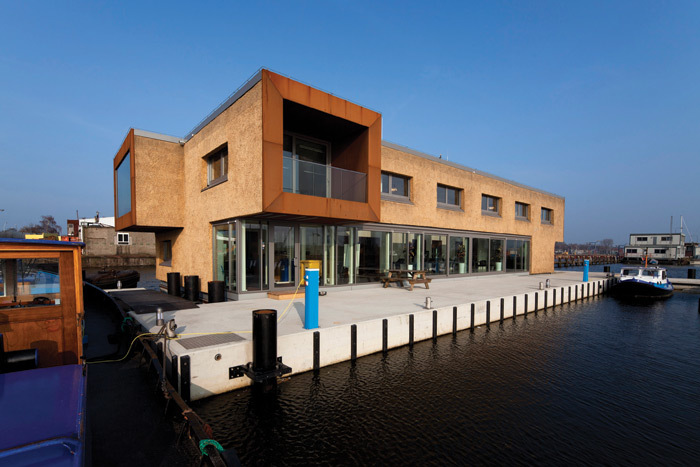 Designed for Waternet, the firm dedicated to cleaning Amsterdam’s canals, the building contains office space, a canteen, and locker rooms within a timber-frame construction set on a concrete base, with a thatched facade made from reeds and pre-rusted corten steel frames for large, projecting windows. And let’s not forget floating swimming pools. Urban harbour and river baths are already popular across Europe, comprising floating elements and facilities projecting in to waterways (often with filtering systems making the water healthy to bathe and swim in). In Copenhagen, there is a whole series of them — most famously the Islands Brygge harbour bath designed by BIG and JDS. 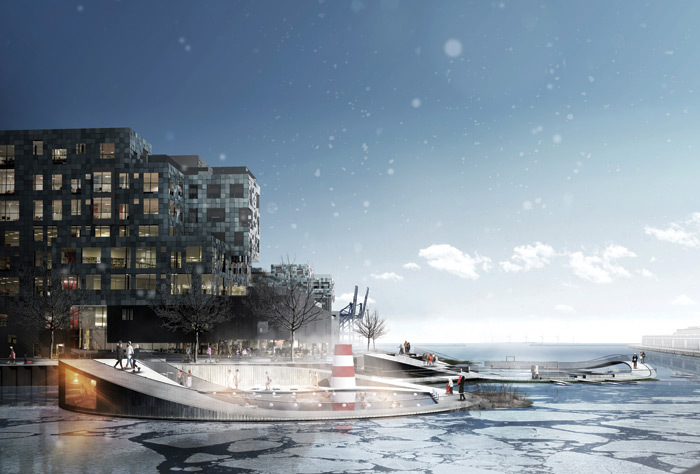 CF Møller is now working on Nordhavn Islands, a trio of harbour baths that double as ‘floating classrooms’ teaching young people about water and watersports. While some projects are no doubt moving forward, the complex challenges of creating expensive floating constructions in crowded cities are proving more difficult for others. The Thames Baths proposal from Studio Octopi, comprising a pontoon of three freshwater pools in the River Thames, has yet to gain seed funding. Similarly, +Pool, the floating, Olympic-sized water-filtering swimming pool designed for the East River in New York, garnered huge amounts of attention when it was unveiled in 2010; eight years later, however, the complete funding, as well as exact location, are yet to be agreed. Though these projects are designed to float while being permanently moored in place, others are imagined as mobile units — repurposed boats that can move along waterways according to need. Recent projects include Swale — a 465 sq m deck barge transformed by artist Mary Mattingly into a ‘floating food forest’ to promote urban agriculture and healthy food education in New York every summer — and the Floating Church, a converted canal boat design from Denizen Works that aims to provide a community and religious hub along London’s canal network following construction this spring. But such ideas are hardly new: the use of ships to serve social, community, or cultural needs, has a long history. Floating hospital ships — still in use in flood-hit Bangladesh — were first seen in New York in 1875 and Boston in 1894. British prison ships were in operation from the mid-18th century up until the closure of HMP Weare in 2006; New York still has one operational 800-bed prison barge, the Vernon C. Bain Correctional Center, docked just off the Bronx’s southern shore. The rise of ocean liners in the early 20th century (see page 156) gave rise to a whole culture of cruise-ship floating hotels. Nevertheless, where once urban waterways were dirty and polluted, crowded with ships, barges and boats transporting vital trade and goods, now they are home to floating houses, farms and swimming pools. But will these creations end up crowding the water once more? As with all urban development, a balance needs to be struck between harnessing a city’s assets and protecting them. There is no doubt that available land in our cities is rapidly decreasing, and the arguments have been laid out against urban sprawl into the countryside — but is sprawling on to the waterways the best move forward? While repurposing outdated transport infrastructure is often wise, we should probably remember that urban waterways are not just former industrial routes; they are precious natural landscapes in our cities.